If you're old enough, you remember exactly where you were when you heard President Kennedy had been assassinated in Dallas. You probably also remember where you were when Neil Armstrong stepped on the moon in 1969 or when Mt. St. Helens erupted in 1980. For me, "The Catch" is one of those moments. I don't recall what macro swill I was drinking at the time, so never mind. But I certainly recall watching Dwight Clark leap to catch the Joe Montana pass that gave San Francisco the lead and soon enough a victory in the NFC Championship game. The date was Jan. 10, 1982. 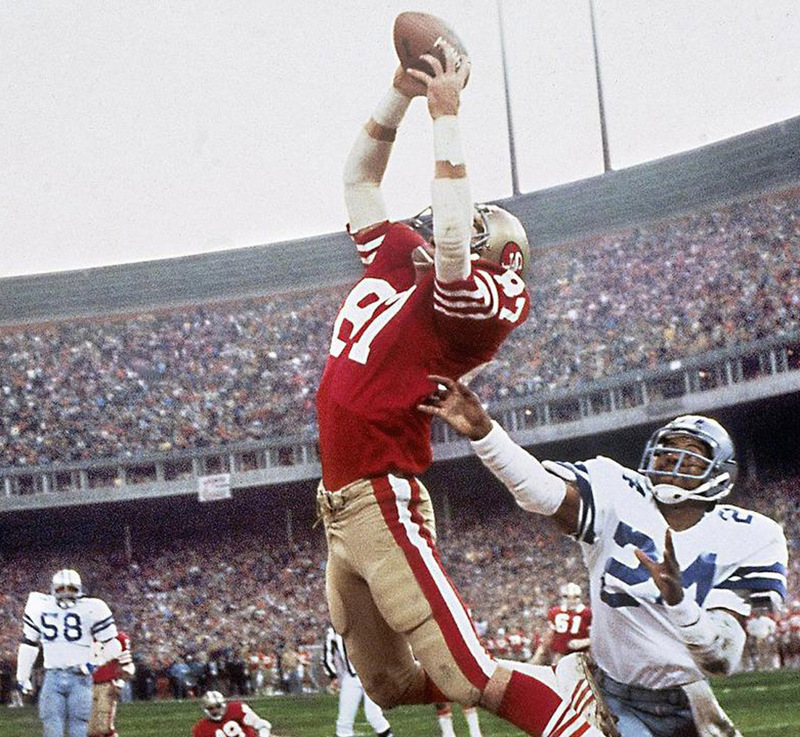 "The Catch" became instant legend around the Bay Area and in football circles. It was also a watershed moment for the NFL. Dallas had been the dominant NFC team during the 1970s. This game signaled a shift, as San Francisco would displace the Cowboys and go on to win four Super Bowls during the 1980s. I bring this story up, of course, because Clark passed away yesterday at the age of 61. Far too young. He was struck down by ALS, also known as Lou Gehrig's disease, which evidently afflicts several hundred thousand people worldwide each year. Obviously, top athletes are not immune to this dreadful disease. On that January day, I watched the game impatiently, uncomfortably in my Lewiston, Idaho apartment. Dallas had been so good for so long that a 49ers victory seemed improbable, despite the impressive play of Montana and company that year. For the record, I had become a nervous Niners fan after attending some games at Kezar Stadium as a kid. I watched Dallas beat some good 49ers teams in the playoffs during the early seventies. The memories made me queasy. There were several lead changes during the game. San Francisco grabbed an early lead, but Dallas led 17-14 at the half. The 49ers jumped ahead 21-17 in the third quarter. Still, with a few minutes remaining in the game, the Cowboys led 26-21. That's when Montana went to work and led the Niners on the drive that culminated in "The Catch." Reaching third and three at the Dallas 6-yard line with 58 seconds on the clock, Montana called a timeout. An animated sideline discussion with coach Bill Walsh ensued. The called play, Change Left Slot – Sprint Right Option, was intended to be a quick pass to Freddie Solomon, who had scored on the same play earlier. Clark and Solomon were primary receivers, but Solomon was apparently the first option. When he slipped at the snap, the play's timing was blown. A strong Dallas rush flushed Montana deeper to the right than the play intended. Meanwhile, Clark slipped through the Dallas secondary and ran parallel to Montana deep in the endzone. Many have speculated over the years that the backpedaling Montana intended to throw the ball away on the play. The throw was very high; I assumed it was a throwaway. But Montana knew where Clark was supposed to be. Joe was knocked to the ground and didn't see Clark make a superhuman leap and grab the ball with his fingertips. He only saw the receiver's feet come down. There was an instant of momentarily disbelief inside Candlestick Park. I had a similar feeling at home. But the play was good and, after the extra point, San Francisco led 28-27. It's a forgotten detail, but the game wasn't over. There were 51 seconds on the clock and Dallas needed only a field goal to win. It didn't happen, but there were some nervous moments. For longsuffering 49ers fans, the win was like the curtains opening on a bright, sunny day or a dense fog quickly lifting. After years of futility, the team had broken through. And they would be a dynasty for the next decade. That's why many fans, including myself, remember "The Catch" so fondly. I only wish I could recall what I was drinking at the time. Something bad, for sure. Dwight Clark went on to help win two Super Bowls in San Francisco before retiring after the 1987 season. He later served in front office roles for the 49ers and Browns. Years later, Clark said he never tired of talking about or seeing the big play. "I see that catch every day," he said. "I may sit and think about that moment a couple of times a year, and how awesome it was to be a part of that play and to be a part of the 49ers in the '80s." As improbable as "The Catch" seemed, it pales next to yesterday's announcement that Clark passed away at such a relatively young age. He announced that he had been diagnosed with ALS last year, but news of his death is still a shock. He was a modern warrior, though apparently a gentle one.